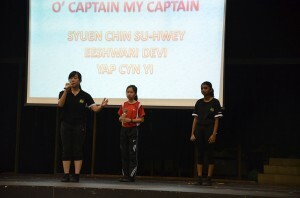 This year’s edition of R.E.A.L Schools National’s Linguistics Week celebrated a ‘first’ when all three of its Cheras Campus language departments collaborated to organize the annual event. These were namely the English, Bahasa Melayu and Chinese language departments. In conjunction with the event, the English department also collaborated with Soka Gakkai Malaysia and the Linguistic Club to hold a special two-day exhibition entitled ‘Everything You Treasure – For a World Free from Nuclear Weapons’. The exhibition aimed to raise awareness of the devastating effects of nuclear weapons and what individuals can do to prevent possible nuclear catastrophe in the future. The highly-encouraging response to 2016’s Linguistics Week can be attributed to the host of fun, diverse and engaging activities that were concurrently offered by the trio of language departments for the first time. It is also safe to say that the annual event had gone a long way in promoting greater love, pride and interest towards our culture and language. The post Cheras Campus Celebrates Linguistics Week appeared first on best international schools in malaysia.